Lehman’s commentary on public policy has been carried by The New York Times, The Wall Street Journal, The Washington Post, National Public Radio, National Journal, National Review, Investor's Business Daily, Wired magazine and nearly every daily Michigan newspaper. He has addressed audiences at the National Conference of State Legislatures annual meeting, the Detroit Regional Chamber's annual Mackinac Policy Conference and gatherings of economists and policy experts in Europe, Latin America, Africa and Asia. He is vice chair of the National Taxpayers Union and a member of the board of directors of the Atlas Network, which serves free-market think tanks around the world. 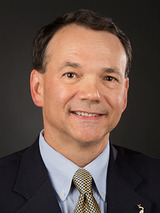 Prior to his public policy career, Lehman was an engineer and project manager for nine years at The Dow Chemical Co. He graduated from the University of Illinois College of Engineering and is a registered professional engineer. Lehman and his wife, Karen, are the founders of Midland County Habitat for Humanity. He twice received the Dow Chemical Vice President's Award for Community Service. He is an ordained deacon in the Orthodox Presbyterian Church.